Charles Neff’s association with OCU began almost 20 years ago, when he arrived on campus as a Bishop Scholar. He was responding to a call to ministry received while a youth at East Cross UMC in Bartlesville. Involvement in OCU student life and a two-year work/study position in the chapel with Dorothy Graham solidified his relationship with the university. On June 1, Dr. Neff began serving as vice president for University-Church Relations and dean of the chapel. Bishop Robert Hayes Jr. said, "He represents the finest The United Methodist Church has to offer, and we look forward to a long and fruitful relationship between OCU and The United Methodist Church as he serves in this capacity." Neff comes to the position well qualified. At OCU he earned a B.A., in religion, and an M.B.A. He received his Master of Divinity degree from Methodist Theological School, Ohio, and the Doctor of Ministry degree from Wesley Theological Seminary, Washington, D.C. He most recently served as senior pastor of McAlester-First UMC. He also was pastor of Green Valley Chapel UMC, Mount Vernon, Ohio; associate pastor of Christian education, Tulsa-Faith UMC; and assistant to the senior pastor in establishing Edmond-Acts 2 UMC. Neff led McAlester-First for seven years, a time that included church mergers in 2009 and 2013 as well as construction of a $2.4 million campus in 2012. "We are looking forward to having Dr. Neff’s proven leadership on campus," said OCU President Robert Henry. "He has a breadth of dynamic church leadership experience, and as an alumnus with two OCU degrees, he is already a part of our community." Neff was ordained in 2005 as an elder in the Oklahoma Conference. He has served on the Ministerial Recruitment & Nurture Taskforce and the Annual Conference Council, and he is secretary of the Committee on Finance & Administration. He has been a member of the McAlester District Committee on Ministry and served as president and vice president of the McAlester Ministerial Alliance. Married 15 years, Charles and Laura Neff have two children, John and Emma. The new chapel dean said, "As I enter into this new role, my desire is to explore new ways for OCU and our churches to partner in ministry together, including ways that students and faculty might go out to churches to teach short-term studies or offer special programs, as well as additional ways church groups might come to OCU to participate in exciting events, programs, lecture series, and performances." Rodney Newman, previously university chaplain, will continue serving as OCU’s director of Religious Life, where he will lead the Monday Evensong worship services and coordinate student ministry. To explore a ministry partnership or for more information, contact OCU University-Church Relations at 405-208-5060. 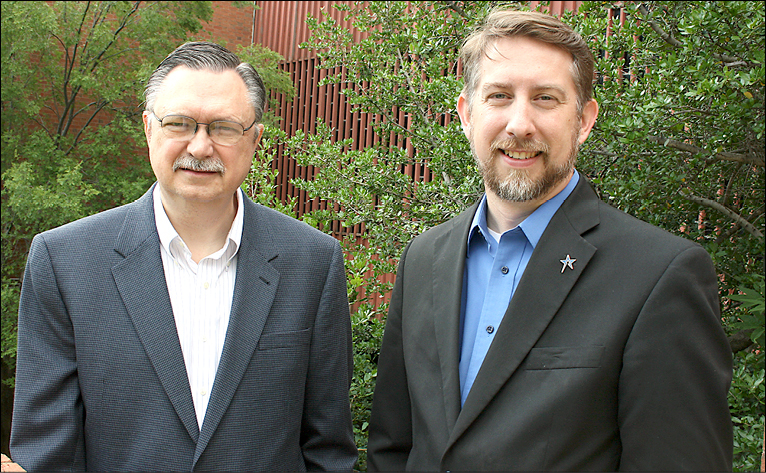 Rodney Newman, left, and Charles Neff comprise the chapel leadership at Oklahoma City University.